By Jeff Aranow: Last Saturday’s fight between interim WBA heavyweight champion Luis “The Real King Kong” Ortiz (25-0, 22 KOs) and Tony “The Tiger” Thompson (40-7m 27 KOs) averaged 740,000 viewers on HBO Boxing After Dark with a peak of 807,000 viewers, according to ESPN. 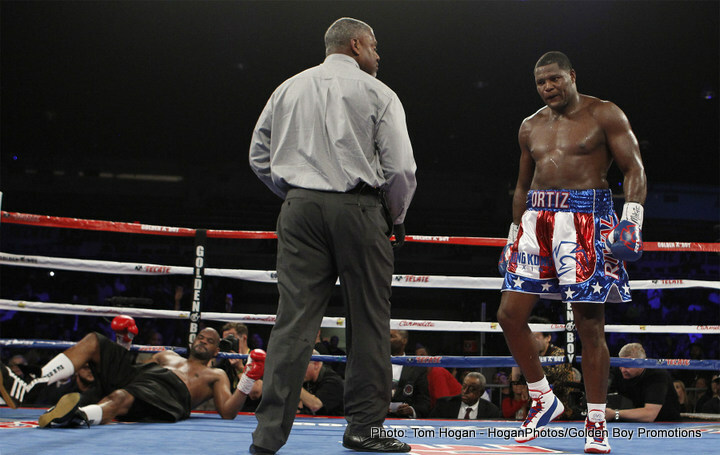 Ortiz stopped Thompson in the 6th round after knocking him down three times in their fight at the DC Armory in Washington, DC. The ratings were a positive upsurge from the 36-year-old Ortiz’s previous fight against American Bryant Jennings from last December. That fight averaged 616,000 viewers. However, perhaps one reason for the increased ratings for the Cuban Ortiz’s fight against the 44-year-old Thompson was the fact former WBA light welterweight champion Jessie Vargas was on the undercard fighting the previously unbeaten Sadam Ali. Vargas had recently fought Tim Bradley last year and lost a 12 round unanimous decision on HBO. That fight attracted a lot of interest due to Bradley. It’s nice that Ortiz’s ratings went up 20% from his last fight against Jennings. However, it’s still too early to know for sure if this is a sign that Ortiz is getting more popular. As I said, it might be due to Jessie Vargas being on the undercard rather than Ortiz being the one that attracted the fans. The co-feature bout on the Ortiz-Thompson card between Vargas and Ali averaged a respectable 726,000 viewers on HBO with a peak of 848,000. Those high numbers suggest that the fight that the boxing fans were interested in was the Vargas-Ali fight rather than the Ortiz vs. Thompson fight. In hindsight, Golden Boy Promotions should have had the Ortiz-Thompson match as the co-feature and the Vargas vs. Ali fight as the headliner fight. Golden Boy has a tough job ahead of them to try to make the 36-year-old Ortiz into a star before he ages out. He’s up there in age, and he doesn’t have the fan base to attract the better heavyweights to fight him. Ortiz does have HBO behind him, but they are only going to offer so much money to get the better heavyweights to fight Ortiz. I do not think HBO will offer enough to get someone like Tyson Fury, Deontay Wilder, Charles Martin or Anthony Joshua to fight Ortiz. For the top fighters to take risks with their careers to fight an opponent like the 6’4” Ortiz, it’s going to take a lot of money. That’s money that just isn’t there right now for Ortiz. In order for him to get the big names to fight him, he would probably need to be able to fight on HBO PPV, and I don’t see that happening ever. Ortiz may have to be satisfied with one day becoming the next Ruslan Chagaev type of heavyweight champion when/if he wins the WBA heavyweight title. Ortiz would be a champion, but few people would know who he is or that he exists. The Ortiz-Thompson and Vargas-Ali card likely would have brought in better ratings if they didn’t have competition from Showtime Boxing, who put on their own competing card on the same night last Saturday night between unbeaten 154lb contender Julian Williams vs. Marcello Matano. That fight attracted an average of 311,000 viewers on Showtime. Williams ended up stopping Matano in the 7th round. It was not a great fight, but it still may have pulled away fans from the Ortiz-Thompson fight card.